ARTO MUNDO from Lokeren (Belgium): a band under direction of multi-instrumentalist and composer Jacques De Munck. They are musicians who go in against the mainstream and create a popular sound with influences from all over the world using ethnical instruments and diverse styles. Arto Mundo cannot be easily categorised. Two generations create music together and that is why they can reach a very broad audience. Young and old together on stage give this group a charming appeal. There is a craving for music with melody and diversity within the music loving community. The musicians of Arto Mundo want to use all their musical skills without being limited by any set of rules. They want to surprise and renew instead of rechew. This creative variation is their trademark. ARTO MUNDO presents a versatile repertoire of styles and original instruments from diverse continents like: colourful India (sitar, bansuri), joyous Africa (kora, ballophone, thumbpiano), mesmerizing Egypt (Egyptian lute), forthright Greece (bouzouki, baglama, dzoura), redhot Cuba (tres), Western music (concertina, lute, guitars), North America (native flute), Latin America (charango), the Caribean (steeldrum) and also ethnic percussion. ARTO MUNDO brings flamenco, soukous, rumba, salsa, bossa-nova, gypsy-jazz, rèbètico and Indian raga’s. Moreover ARTO MUNDO lets the public enjoy beautiful closeharmony of both lighthearted and moving songs. ARTO MUNDO has been around for years and does mainly concerts in Flanders, Germany, France and the Netherlands. In their shows they primarily bring own compositions. These compositions have roots in Europe, Latin America, Africa, India and the Middle East. He is an artist, a pioneer in discovering new sounds. Somebody who dares to experiment and juggle with different styles on ethnical instruments. In his teens he played with his father’s orchestra. Later he was guitarist in different, mostly African groups. He lived in Congo for years. There he played with African musicians, and their music has kept on haunting him. 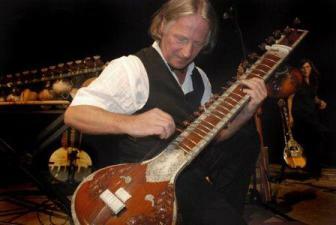 He was possessed by world music, started to journey around the world and collected various instruments. Usually he learned to play these instruments by native masters in their respective homelands. He then infuses his own musical taste into his newly learned technique. These efforts have been successful. After many years he now is a virtuoso on sitar, bansouri, kora, steeldrums, concertina, native flute, baglama, dzoura, flamenco- and gypsy guitar, etc. In 2006 he won the 'Muse of Sabam' for his whole oeuvre. He has won several international prizes. (i.e USA Songwriting Competition (33000 participants) and UK Songwriting Contest ). He has recorded many albums.